It was a bit wet here on the Kapiti Coast, NZ yesterday. 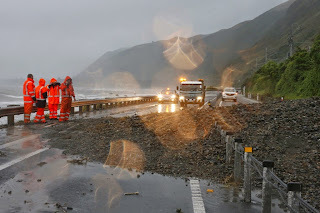 We had a lot of rain and there was flooding, which caused a major slip on the main highway disconnecting us to the city of Wellington. Chaos ensued. A man died, stuck in his car in a flooded area. My backyard filled with water, but not above the level of the grass. My sun room leaked and a giant puddle formed outside the front door, but with being on a slight hill, the house was never in danger. Though, there were evacuations further down the road due to the local stream rising. The local schools were closed, my kids were home and spend the day playing computer games rather than studying, and they were hoping school was not on today either. Which it is, despite the trains not running and no buses as replacement, which affects those coming north into this area. My husband is still stuck in Wellington, but was able to stay with my mother and brothers overnight. 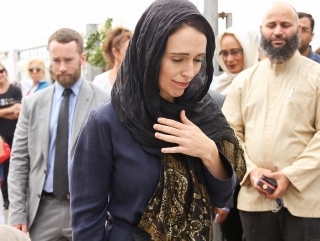 Luckily he had a change of clothes and a toothbrush due to a trip to Auckland and back previously. Fortunately, if something like this ever happens again, a new road is being built connecting Wellington to the Kapiti Coast, which will give a much better alternative route rather than the single lane in each direction issue prone to slips and flooding we have now in places on the state highway.